Ode to a Cool Cat | "…but I'm not the only one…"
This cat. The one and only Fluffy, so named by my 6 year-old sister and my 8 year-old self, was one in a million. 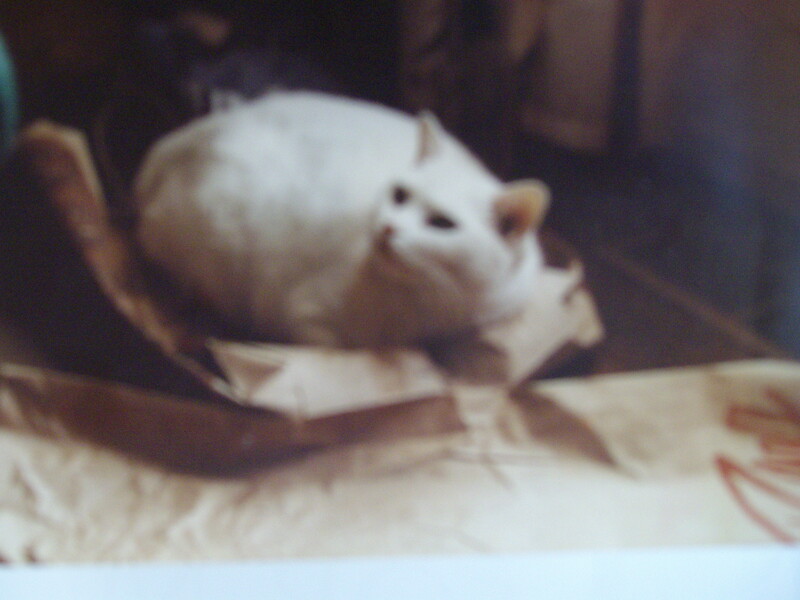 Just a baby when we got her; she was snowy white, skinny, and, yes, fluffy all over. She was alternately Tigger-bouncy and Pooh-snuggly. I use the Winnie-the-Pooh analogy very deliberately because for the next 16 years, I was her (Christopher) Robin and she was my Pooh. She was my Peace. She slept on my chest at night from the start. Even when she reached her adult weight of 16 pounds, every night she purred me to sleep. I’ve yet to find a better sleep aid than breathing to the rhythm of that cat’s contented purr. She learned to fetch a little foil ball. Her Scooby-Doo skids when she hit the wood floor –they were as comical when I was 18 as when I was 8. She internalized our school schedule-from 3rd grade through college. My mom said that about 30 minutes before my sister and I were due home, she’d leave her window perch in the sun and start lurking at the front door. We were always greeted, not with the aloof “what’s your name again?” attitude that the uninitiated project onto cats, but to an almost puppy-like joy, with more purrs, meows, and an unapologetic “where the HELL have you been?” (yes, I speak Cat). If I was getting yelled at, there appeared my snow-white protector, slinking around my ankles and wailing in protest. A lot of arguments would end in giggles because you just had to laugh at her bravado. She listened to thousands of hours of my guitar-playing and singing. I was Linda Ronstadt, Stevie Nicks, Karla Bonoff, and Bonnie Raitt-she was my audience of thousands. She snoozed at my side while I read every book I could get my hands on. By my teenage years I was chain-smoking as I read–she never complained. Though it’s possible I saw a haughty glare more than once when the room got too foggy. When I cried, there she was, nudging at me and then nestling in for the duration. When I didn’t understand anything, she exemplified unconditional love — by way of just being there and doing her old-soul Fluffy thing. This cat, this best friend in white fur, was one-of-a-kind. She was Peace on four paws. Her illness was very brief, for which I was grateful. She was an indoor cat who was allowed to go out and play, so she contracted Feline Leukemia. Fortunately again, she didn’t become ill until she had lived a good long life. My only regret? When the time came to let her go, I didn’t know that I would have been allowed to stay with her for the end procedure. I did say my goodbyes and “thank yous” in the exam room, but left when the doc came in to take her back. I would have eased her through myself if I’d known I could. So for future reference, pet companions: pass that info along to your kids so they can be informed. Now, if it should come to an assisted end for Daryl the Wonder Cat or Chloe the Hut (in the hopefully VERY distant future), I’ll also be able to use Reiki to help them along. Today’s tribute is brought to you by Our Companions Animal Sanctuary*, to which a donation was made in my childhood companion’s name. Pounce in Heavenly Peace, Fluffy. *I encourage you to click the Our Companions link on the right to see the great work they’re doing. So true…the unconditional love pets give is priceless. Thank you Stacia! I will look into that service, and definitely use it if necessary. I had no idea that something like that existed! I actually had the opportunity to help a sick stray this past week. He was at my school, meowing like crazy, very approachable and affectionate, and starving. He was a young orange tabby with beautiful amber eyes. My fellow teachers took up a veterinary collection, another one brought a carrier out of her classroom, and I volunteered to take him home, have him vetted, and find him a home. Unfortunately, the Vet gave me very sad news-the little boy was so sick with Feline Leukemia that he had hardly a red blood cell left. So I made the tough decision that no one wants to make. I stayed with the little guy, stroked him, and talked to him as the gentle Vet did what he needed to do. The brave kitten purred his way to the next life, and I felt like I not only helped him, but my own childhood friend, who no doubt was there to meet this no longer sick and bedraggled orange kitten. It was a tough day, but somehow healing at the same time, if that makes any sense.